Video of Reese Witherspoon giving her star on the Hollywood Walk of Fame a pep talk became a meme this week, and the actress herself has now approved. Witherspoon dropped by her star ahead of the “A Wrinkle in Time” premiere earlier this week, sharing the reunion with an old friend on her Instagram story. Witherspoon received the star in 2010, and apparently the intervening years have been rough, forcing the actress to get down on her hands and knees to do a manual cleaning. Fans have since taken the advice she offered the floor tile to heart, applying it to their own lives. And now Witherspoon has cosigned the practice. So, don’t let people walk all over you. You’re a queen. "Home Again," Reese Witherspoon's new romantic comedy with Michael Sheen about her return to L.A. as a 40-year-old single mother celebrated its premiere at the DGA in West Hollywood with a Sunset Tower after party on Tuesday night. Hallie Meyers-Shyer (left) wrote and directed the film that also stars Lake Bell, Candice Bergen and Jon Rudnitsky (right). Family on the scene: Husband Jim Toth and Witherspoon's lookalike daughter Ava Elizabeth Phillippe clutch their tickets. Reese and Ava were not the only mother-daughter duo in the mix. 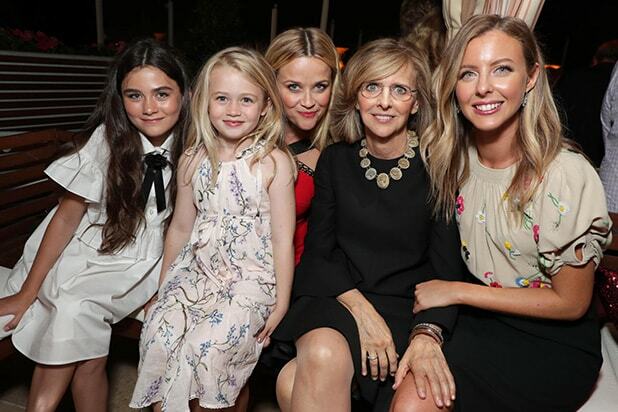 It is a family affair for producer Nancy Meyers (left) and her daughter Hallie Meyers-Shyer. Reid Scott is the man in the middle. Producer Erika Olde, Witherspoon, and Open Road CEO Tom Ortenberg. This was Open Road's first premiere since being acquired by Tang Media Partners earlier this month. Tang Media Partners founder Donald Tang poses with Rob Friedman, Tang's Chairman/CEO of TMP Entertainment. This team is ready for "Home Again's" Sept. 8 release: stars Lola Flanery, Eden Grace Redfield and Witherspoon, with Ortenberg, Meyers and Meyers-Shyer.